Just before midnight on the East Coast, the Red Sox secured their 11th ever World Series victory with a convincing victory over the Cleveland Indians. Didn’t David Ortiz look cute with his goggles on, ready to celebrate? With the Yankees sadly eliminated early this year, I’ve felt free to root for the Red Sox throughout the Cleveland series. There’s nothing like October baseball in the Northeast. Last weekend, by chance, I ended up at the Blues Jean Bar in the Marina. They have jeans, jeans, and more jeans. It’s rather impressive. However, I did a little research and it seems that their prices are over retail, so I doubt I would ever buy anything there. I also don’t like the fact that they keep all the jeans behind the “bar,” so you have to ask for everything. One thing I hate when shopping for clothes is interacting with the sales people. Since last weekend I’ve given myself a minor crash course in premium denim. No, I definitely can’t distinguish the pocket design of one brand from another, but I did find a pair of jeans from AG called Great Gatsby. Being a complete sucker for all things Gatsby, I immediately wanted them. Not only did they bear the Gatsby name, but they also reminded me of another Gatsby-related piece of apparel, the Gatsby shirts from J. Peterman, which I first encountered in the Peterman catalog ten years ago when I was in high school. However, after thinking about it, the AG jeans just seem downright stupid to me. While the Peterman shirts at least claimed to be inspired by Gatsby—the very shirt that Gatsby wore! the same sort of shirt that he would toss on the floor causing Daisy to weep!—I could never imagine Gatsby wearing AG jeans, not then and not now. Though I can believe in the Peterman shirts, silly as they—and his whole catalog—may be, I can’t really believe that there’s anything at all Gatsbyesque about the AG jeans. It’s sort of like Moleskine notebooks, where the labels claim that Picasso and Hemingway used them. And, in fact, they actually did use similarly designed notebooks. Dave Eggers and many others actually use Moleskine notebooks themselves, which adds to their appeal. Of course, having the right tools counts for nothing if you don’t know how to use them, but their inspirational power—commercial and exploitative as it may be—also carries a degree of reality. Conversational reading has a fairly sharp piece about one of my favorite literary critics, James Wood. I don’t think Wood believes there is much value in metaphors like Flaubert’s because as a reader he doesn’t appreciate what use they have in a novel. Wood is comfortable dissecting how an author attaches character traits to realistic people, but when an author tosses in an enigmatic metaphor, Wood finds it too fuzzy, and therefore meaningless. I think, perhaps, if he were better at imagining his way into the psychology of a work, he might better understand the value of metaphors like Flaubert’s. Esposito seems to go a little over the top to make his point, for, after all, enigmatic metaphor and social commentary doesn’t really matter much without the existing creation in the novel of one real human being. Prompted in part by this New York Times article, I’ve been reading up on recent cancer research. Most articles I’ve read, are, unfortunately, unlinkable (like this one), having come from ridiculously expensive medical journals. One of the recommendations I encountered in the Times is essentially to spend more resources on soi-disant “blue sky” research. One of the places that I became aware of at the beginning of this decade that actually works on this sort of stuff is the Webb-Waring Institute, which operates free of commercial interests. An era ended in New York last week with Joe Torre’s departure from the New York Yankees. The teams from 1996 through 2001 played an essential part in my sense of who I am as an individual—Mo; Jeter; Posada; waking up at obscene hours in France to listen to the 2000 Subway Series; the 2001 playoff games that started on one day and finished the next, ending in October—and I’m rather sad about the end of things for Torre. These letters to the Times sports section express that sadness better than I can right now. Drew’s case here seems to raise two questions: one about wasted potential and another about making one’s life’s work something for which one has no passion. But does Drew really have no passion or does he just appear that way? And is that such a bad thing? And what really is the difference? Is Drew simply not a hard worker? I think the sentiment about Drew results from a combination of his not having lived up to his projected potential from the time he was drafted and his apparently blasé demeanor on the field. If the guy had driven in 100 runs this year, would the fans really be all over him? I doubt it, but then again, when you play in front of thousands and thousands of people, performance matters in both senses of the word. The package for the poorest should be improved. At the very least, the duty- and quota-free access to markets in industrial countries should be extended to cover more of the poor countries’ most competitive exports, starting with textiles. Middle-income countries should also offer equivalent open access for exports from the least developed. And rich countries should tightly limit any exceptional subsidies and protections for agricultural products, like sugar and cotton, that poor countries can export. The central work of the writer is spending a lot of time alone in a room, looking inside yourself and putting what you find on the outside. 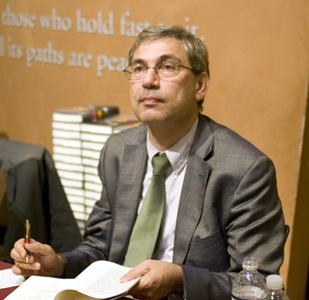 Pamuk’s comments on always falling into depression when he reads the English translations of his work because English is the one other language he understands well enough to be critical of. Overall, I came away from the event reminded of my love for both writing and reading, and I look forward to finishing up Pamuk’s Other Colors and then diving into Snow.